Rockhouse Falls is another fantastic waterfall in Fall Creek Falls State Park. The waterfall plunges 125 feet into Cane Creek Gorge along with nearby Cane Creek Falls as you can see in the picture above. The setting is amazing and on a clear day it should make for some great photography. Unfortunately it was wet and misting at daybreak when I took my pictures. Still it was a great time, no people and very peaceful, albeit a little damp. The Fall Creek Falls nature center is located at the top of the cliff about midway between the two waterfalls so it's an easy walk to an overlook of the amphitheater area. 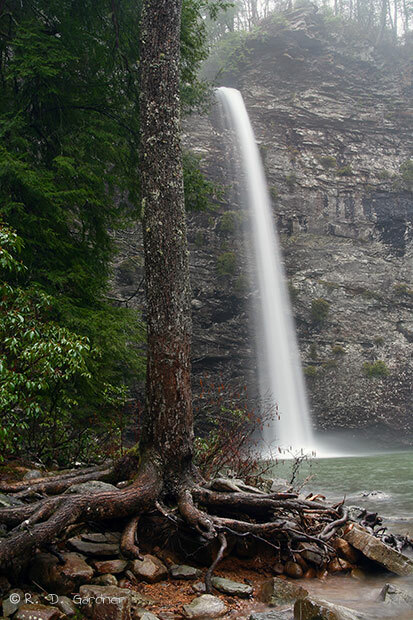 For a slightly lengthier discussion of Fall Creek Falls State Park visit the Fall Creek Falls page. As there are a minimum of two different roads into the park, I recommend you use the following link to customize your own directions to Rockhouse Falls. There are actually a couple of different hikes for viewing this waterfall. For reference you might want to pull up the trail map. The first one, the one I took, is the Cable Trail to the base. Go out the back of the nature center towards the overlook and follow the trail to the right as it parallels the road. Don't hug the edge of the cliff as this is an unapproved and dangerous trail. Instead go up the hill slightly towards the road until you find the official trail. After crossing Rockhouse Creek you will come upon a sign for the Cable Trail and the cable that will take you down to the base. This can be seen in my Cane Creek Falls video. Total round trip length is about 0.3 miles. Difficults is easy except for the 200 feet of cable where you cling to the rock face like a mountain goat. There is also the Gorge trail. 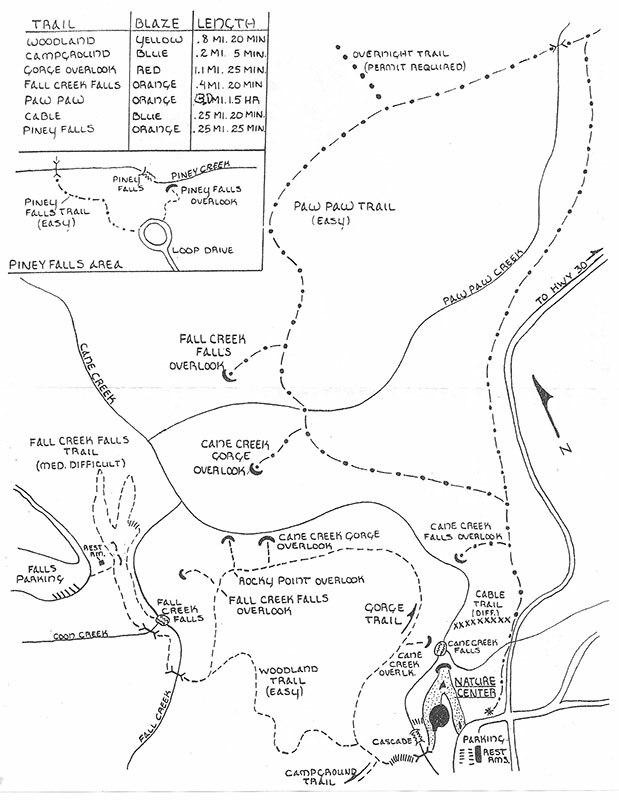 See the trail map. 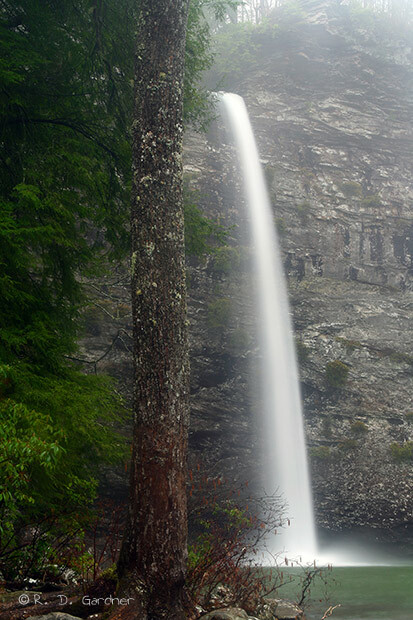 Take the Woodland trail toward Fall Creek Falls. Take a right at the first fork after crossing the swinging bridge (fun!!) and you'll be on the Gorge trail. This will take you to a nice overlook of the two waterfalls via a short spur trail. Round trip distance from the nature center is about 1.0 mile. Easy trail with no extreme elevation changes. It was early - really early - about 0630 in mid-March so fairly low light conditions. There had been heavy rains for two days previously so water flow was high. The rains had not pushed out but continued to poor down on my head, as well as having foggy conditions. Do go early. Especially in the summertime this pool will be popular so you'll be avoiding people and also getting good lighting conditions. Prepare to get your feet wet for the best pictures. 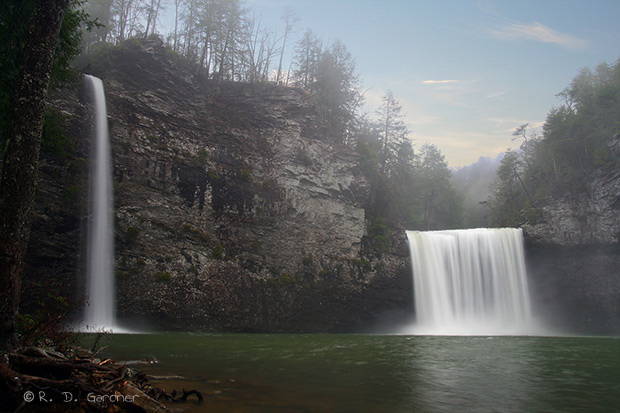 Unobstructed shots of Rockhouse Falls are hard to come by without getting out in the water. I had on gortex boots and balanced on rocks. Still, I would've been better off if I had brought some wading shoes with me. Rain is your friend. Rockhouse Creek can be a little trickle in the summer, just so you know. Also, a good tripod is a must for Rockhouse. This type of waterfall begs for a slow shutter speed. You'll need a wide-to-normal zoom lens here in the 18-55 mm range because of the proximity to the waterfall and its height.